For Indies First Storytime Day, enjoy a break from the outdoor Taste of Glen Ellyn activities with our special guest Jim Aylesworth, author of numerous children’s books and storyteller extraordinaire! If you’ve never had the pleasure of listening to Jim read aloud in his inimitable style, you and your children are in for a treat. Indies First Storytime Day celebrates the art of story and promotes the joy of reading through independent bookstores across the country. There is no cost to attend this event. Please let us know in advance if you would like any of Jim's books signed or held for you by calling 630-469-2891 or sending an email to us at justbook475@yahoo.com. 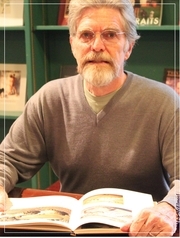 Jim Aylesworth is currently considered a "single author." If one or more works are by a distinct, homonymous authors, go ahead and split the author. Jim Aylesworth is composed of 2 names. You can examine and separate out names.